Walmart is trying to attract a new kind of customer — wealthier people who love to shop online and may never set foot in an actual Walmart store. Walmart is advertising Allswell as a "luxe collection of mattresses and curated bedding." 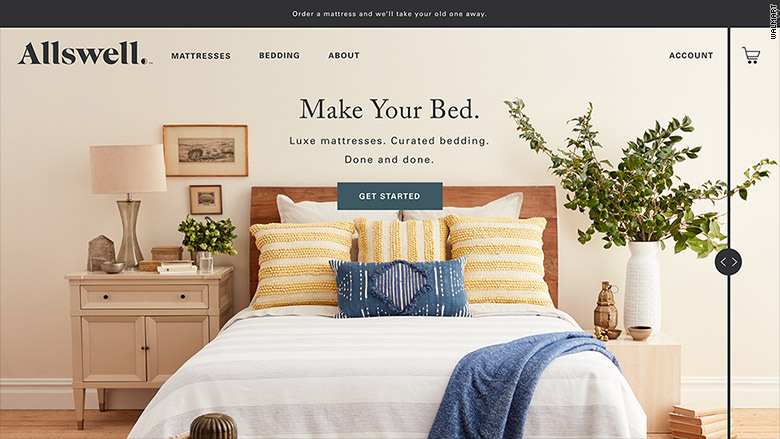 It could be a way for Walmart to steal some thunder from the red-hot online bedding startup Casper, which got an investment from Walmart rival Target (TGT) last year. But it's also the latest effort by Walmart (WMT) to show customers it's more than a big-box retailer. Walmart has unveiled a speciality line of bedding called Allswell. Whew! Nobody can accuse Walmart CEO Doug McMillion and Jet founder Marc Lore, who now heads all of Walmart's online efforts, of sitting idly by as the retail landscape rapidly transforms. But Walmart may need to do even more if it hopes to catch up to Amazon (AMZN).